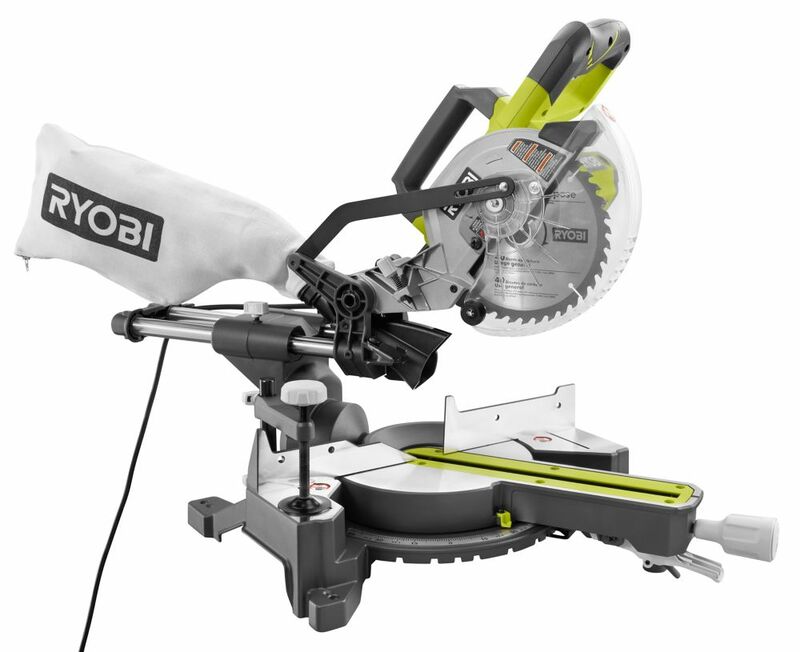 The RYOBI 7-1/4-Inch Sliding Miter Saw is a new edition to the miter family. It can make angled cuts up to 450 on boards all the way up to 6 inch wide, and has a max RPM of 5,350. It also features an LED cutline indicator that illuminates the workspace and makes for easier cuts. Combine that with positive miter stops for all common crown moulding angles, and a quick action lever that gives you the ability to lock in on any angle and you can see how this saw will allow anyone to become a precision craftsman. This Makita Variable Speed Jig Saw includes a lock-on button for extended use and low noise operation (at only 82 decibels), and provides low vibration for steady handling. The sliding dust cover keeps chips from flying and makes blade replacement easy while the hex wrench stores conveniently on the tool. 10 Amp 7-1/4-Inch Mitre Saw The RYOBI 7-1/4-Inch Sliding Miter Saw is a new edition to the miter family. It can make angled cuts up to 450 on boards all the way up to 6 inch wide, and has a max RPM of 5,350. It also features an LED cutline indicator that illuminates the workspace and makes for easier cuts. Combine that with positive miter stops for all common crown moulding angles, and a quick action lever that gives you the ability to lock in on any angle and you can see how this saw will allow anyone to become a precision craftsman. 10 Amp 7-1/4-Inch Mitre Saw is rated 4.6 out of 5 by 283. Rated 5 out of 5 by GMun from Ryobi made it easy. I was terrified of using any saw, but took a chance and got this one based on reviews and price. I just used it for the first time, after watching a million YouTube videos on safety and handling. It was easy to use, and I never felt unsafe using it. I only need to make small frames, so I can't speak to a full range of applications, but this saw is perfect for me, and I'm very happy with it. if you're new to woodworking, get this saw. Rated 4 out of 5 by Anonymous from Spend the extra money and get the 10”, at least.... Spend the extra money and get the 10”, at least. I returned the 7” for it after assembly. Rated 5 out of 5 by Dallas from Wonderful. Wonderful. Rated 5 out of 5 by Mark from Very good I bought this saw about 2 moths ago and it is working great. Specially for the price. I am using it for framing and have not yet road it for flooring material or finish carpentry. Rated 5 out of 5 by eightysixblazer from Great little saw. Stable, accurate, and very lightweight. Perfect for indoor jobs. Very portable. Great little saw. Stable, accurate, and very lightweight. Perfect for indoor jobs. Very portable. Rated 5 out of 5 by Maximo from This is a top notch product all the way around. I bought it to replace column moldings which requ... This is a top notch product all the way around. I bought it to replace column moldings which require lots of precision cuts. It is lightweight and collapses for easy storage. It is convenient that the blade is the same size as for my hand saw. Rated 5 out of 5 by Eugene from I got this saw as a home owner working on a bamboo flooring in a stairwell. It did everything I n... I got this saw as a home owner working on a bamboo flooring in a stairwell. It did everything I needed it to do.